Good views of the Black River drainage and San Carlos Indian Reservation provide a scenic send-off for this trail into the Bear Wallow Wilderness. From the trailhead, views stretch all the way to Mount Graham in the Pinaleno Range 80 miles to the southwest. This striking panorama accompanies you a good portion of the way of down the steep switchbacks that begins the trail's descent into a side drainage of Bear Wallow Creek and eventually to the canyon floor. 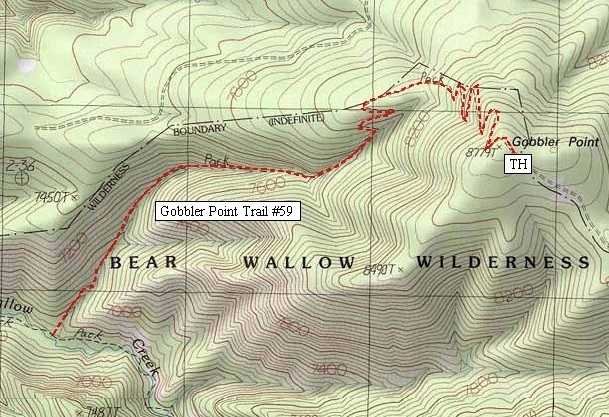 Gobbler Point is the steepest trail leading into the wilderness. It also provides the shortest route to the creek's downstream reaches, which could be important to those interested in fishing the stream's pools and riffles for the population of native Apache trout that have been stocked there. In addition to panoramic views, a mixed stand of conifers, ponderosa pine, and aspen provides a scenic setting for the trail's upper reaches. Those tall upland species gradually give way to clumps of Gambel oak, red-osier dogwood, and bracken fern as the trail looses altitude. At the junction with Bear Wallow Trail on the canyon floor, the trail is set in a park-like community of ponderosa pines and canyon hardwoods, including Arizona ash, alder, and box elder. A sprinkling of wildflowers usually adds a splash of color. No motorized or mechanized vehicles (including mountain bikes) are permitted in Wilderness. The trail is steep, exposed to direct sun, and drops 2,100 feet in 2.7 miles. Be sure to carry enough water. A special use permit from the tribe is required for entry onto the San Carlos Apache Indian Reservation. 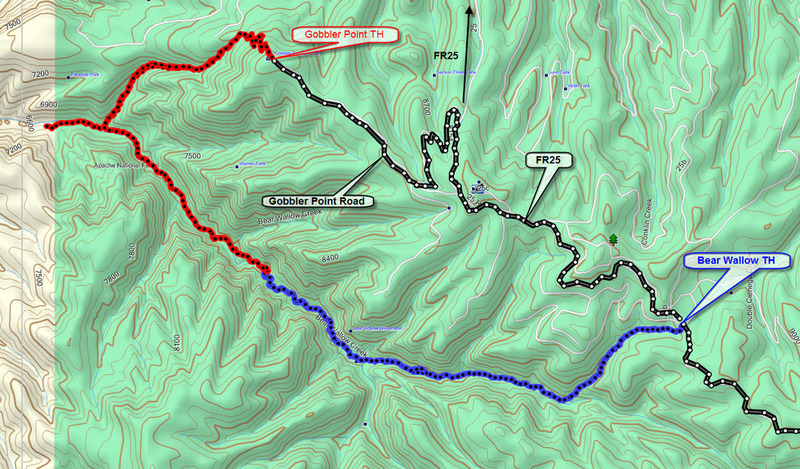 0.9 Drop into drainage and continue descent to Bear Wallow Creek and Trail. 2.7 Junction with Bear Wallow Trail #63. Drive south on US 191 approximately 28 miles to Forest Road 25. Head west on Forest Road 25 about 7 miles to Gobbler Point Road, #8154, on the left (south) side of Forest Road 25. Follow this road left at the first forks and right at the second forks 3 miles to the end of the road. The trail begins at the trailhead poster board.